This weekend, my mother had surgery, and so Boyfriend and I went over to help her while she recovered. I arrived late Friday morning, where I could work remotely for the rest of the day, while Boyfriend arrived that evening after a day at work. Mum got home shortly before noon and was instructed to lie flat and not get up except to use the toilet, so I did a bit of waiting on her. I got her water and made her a milkshake and helped her with her medication. We stayed the night Friday and then on Saturday morning decided to stay one more night to make sure she was doing alright. Part of packing for the weekend was packing up a version of my new skin care routine to hold me over for a night or two. I was able to put together a travel skin care kit from samples and deluxe samples I’ve gotten in packages, plus a sample kit from Trilogy I bought recently. 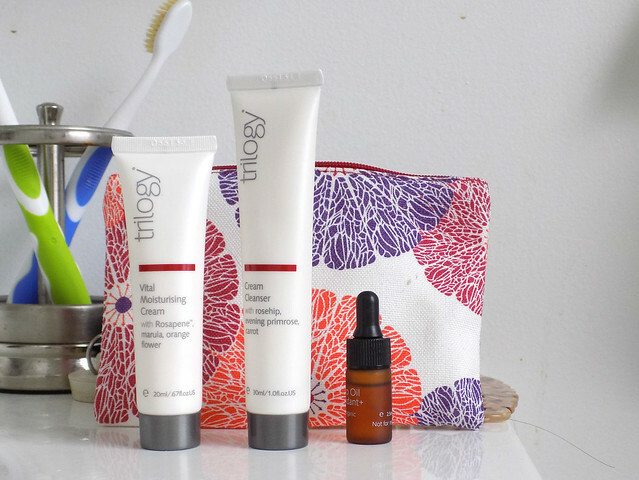 Trilogy Natural Skincare is a natural brand from New Zealand that has a Rosehip range, based upon rosehip oil as an ingredient. I found this sample kit on sale at Whole Foods just after the holidays for half price. It has a sample of the cream cleanser, Vital Moisturizing Cream, and Rosehip Antioxidant+ oil. And the whole thing comes in a little bag that’s great for non-air travel. I tried out the products for a day or two to make sure they didn’t cause immediate breakouts, and then put them away for travel. 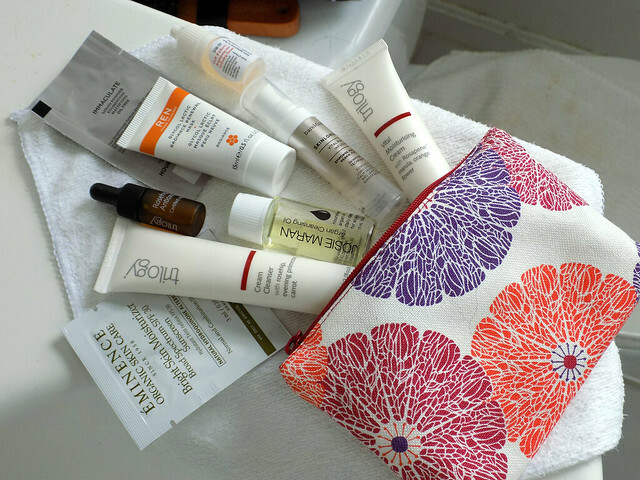 To create my skin care to go kit, I added in a deluxe sample of cleansing oil, glycolic-lactic acid mask, and serums. Then, I popped in some little single-use samples of facial sunscreen and foundation or skin tint. The brands mostly don’t matter, although I’ve recently bought the full-size of the BareMinerals serum because I love it. It’s not a full version of my skin care routine, but it works for a day or two. And anywhere I travel will provide me washcloths. I think the only thing I would add is a mini acid toner instead of the exfoliating mask because I can’t use that two days in a row. I know Pixi makes a travel size Glow Tonic. I just pop all of this into the adorable little bag from Trilogy to go on a car or train trip. I would have to transfer it to a plastic zip-top bag for air travel, but that’s not so much of a bother. This is just for a couple of days’ travel. I’ll have to start working on a kit for longer, as I have to travel for work over the summer.